5.Greenwich Village and the East Village. 3p. irectly at the heart of Philadelphia, on Center Square, a National Historic Landmark rises 510 feet into the air. The exact geographical center of William Penn's original plan for Philadelphia, Center Square, known today as Penn Square, was designated by Mr. Penn to be the location for a building of "publick concerns" - home of Philadelphia's City Hall. 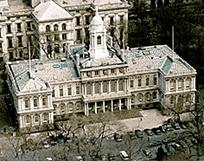 he huge granite mass of City Hall, throughout its 100+ year history, has indeed been a building of "publick concerns". An elaborate temple of local politics, City Hall is one of the nation's finest examples of French Second -Empire Architectural style. Controversy has surrounded the building from its earliest conception in 1860 to the present day. It has weathered severe criticism, hints of bribery and graft, campaigns to demolish it, shortages of funding to maintain it, and disrespect of vandals who deface it. Yet, it has also earned a great deal of respect and admiration as a unique architectural and sculptural achievement. ts future remains uncertain, but its story is fascinating.